Maria Millang and Vanessa Rondeau on the first day of the ride. This summer, two pairs of wheels, two pairs of tires, two pairs of pedals and two pairs of very strong quadriceps took Maria Millang and Vanessa Rondeau across the country. 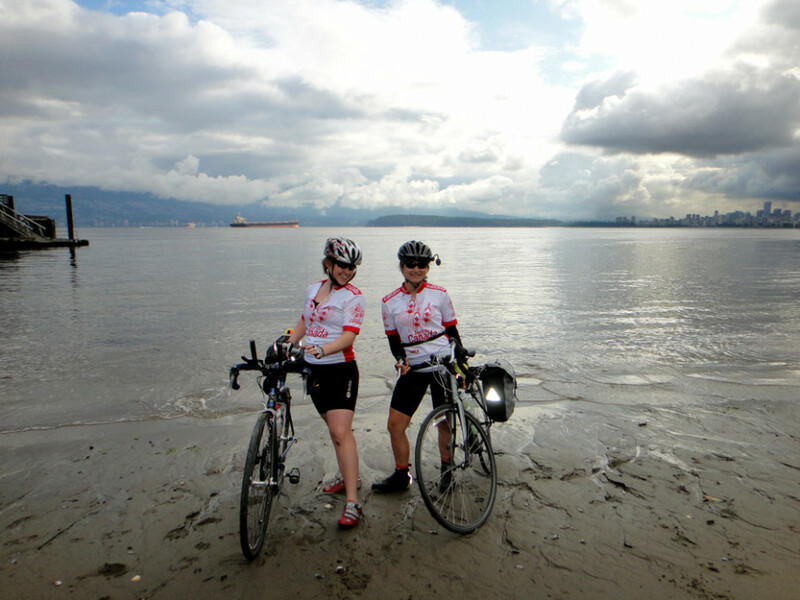 On June 20, both Millang and Rondeau dipped the rear wheels of their bicycles into the Pacific Ocean in Victoria, BC. Last week, on Sept. 2, the two triumphantly rode their front wheels into the Atlantic Ocean at Signal Hill, NL. What happened in between was just less than 8,000 km of pedaling across ten provinces over the course of 72 days—through both a record-breaking heat wave and a hurricane. Millang and Rondeau weren’t alone in undertaking this journey. The two are among 35 participants to complete this year’s Tour du Canada, an annual bike ride that takes participants literally from coast to coast. Millang is a 25-year-old native of Camrose, AB who is set to begin her Masters of Education degree in Counselling Psychology at the University of Alberta this fall. Rondeau is a 20-year-old Montrealer who will be entering the Social Work program at McGill this week. In order to prepare for the tour, Millang took spinning and cross-training classes five to six times a week, and then began riding outside once weather permitted. Rondeau rode between 30 and 50 km up to four times a week, in addition to taking spinning and PowerWatts classes at Mansfield gym several times a week. The tour recommends that riders complete at least 2000 km of pedaling before embarking on the trip. Rondeau said daily distances of rides varied between 50 and 170 km. One thing that was made very clear on the tour was that it was not a race, she said. This year’s group consisted of both male and female riders aged 19 to 69. About one third of the group was under the age of 30 and two thirds aged over 55—with only a handful of participants falling in between. Out of over 30 participants, only about a third were female. Only three of the riders that started the tour were unable to complete it. Two of the three obtained injuries during the ride that prevented them from finishing, while the third had to return home for personal reasons. When signing up for the tour, participants paid a fee to the Tour du Canada, in exchange for receiving access to a truck and two drivers, which would transport their tents and personal belongings from campsite to campsite—yes, after all that biking, tents were their nightly sleeping accommodations. The organization also took care of doing groceries for riders, paying for campsites and ferries, and guiding them across the country. The riders were divided into six groups for “galley duty”. The groups took turns preparing meals for one another at camp. Breakfasts always included oatmeal, fruit and yogurt and either pancakes, French toast or eggs. Dinners varied from a pre-determined menu. As for eating on the road—let’s just say that copious amounts of peanut butter were consumed (some riders were maxing out at seven PB&J sandwiches a day!). Both Rondeau and Millang agreed that while the cycling was difficult, the hardest part of the trip was getting up and back on their bikes each morning—regardless of, well, anything. “It was hard waking up and hearing the rain on your tent in the morning when your legs were killing you and you just didn’t want to get out of bed,” recalls Rondeau. But neither of them regrets the experience, not even a little bit. Both say they learned much about the landscape and quirks of both the people and terrain of Canada—one of which was that this country certainly has more hills than either of them had bargained for. This article originally appeared in The Link Volume 32, Issue 02, published September 6, 2011.